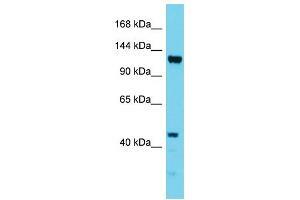 Characteristics This is a rabbit polyclonal antibody against EFTUD1. It was validated on Western Blot. Background EFTUD1 is involved in the biogenesis of the 60S ribosomal subunit and translational activation of ribosomes. Together with SBDS, EFTUD1 triggers the GTP-dependent release of EIF6 from 60S pre-ribosomes in the cytoplasm, thereby activating ribosomes for translation competence by allowing 80S ribosome assembly and facilitating EIF6 recycling to the nucleus, where it is required for 60S rRNA processing and nuclear export. EFTUD1 has low intrinsic GTPase activity. GTPase activity is increased by contact with 60S ribosome subunits. Application Notes Optimal working dilutions should be determined experimentally by the investigator.